Suranadi Park is a conservation area located in Narmada districts, West Lombok and about 13 km east from Mataram city. The name of Suranadi is a combination of two words namely "Sura" meaning God and "Nadi" which means river, so that when it combined Suranadi will significantly mean a river given by god. In the tourist areas there are 3 groups of temples that stood in an area of â��â��52 acres, Pura Ulon / Gadoh,Pura pangentas and Pura Pabersihan. 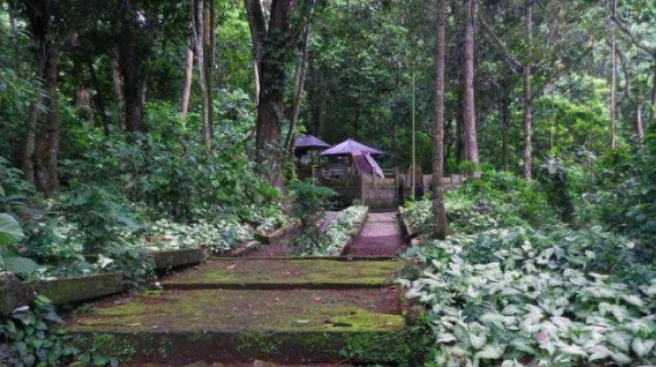 Pura Ulon is directly adjacent to the protected forest in Suranadi park. In the temple there are 2 springs that panglukatan and Petirtan. In the southwest of Ulon Pura, there are Pura pangentas. This temple is the smallest and simplest temple compared to the 3 other temples in Suranadi. Pura pangentas have 3 springs they are pangentas, Panembak and Tirta Mapepada. This temple was used as a place to take water during the Pitra Yadnya ceremony. The last is Pura Pabersihan located at 30 meters in the southwest of Pura Ulon. This temple has a spring named Pabersihan. In addition to enjoying the beauty of the temple building, you can also explore the natural tourism area which is inhabited by various species of flora and fauna. Various trees like banyan, Garu, Terep, Suren, Tamarind and Lime as high as 25-30 meters into an umbrella this region. In this area you will hear the sound of cericit birds, you will also find a lot of monkeys wandering around the tourist areas of this forest.